Military Bridge Across the Chickahominy. Virginia. Otherwise known by the name of its builder, and marked on the map, "Woodbury’s Bridge." The picture is taken at a point where the accumulated water most presented the character of a stream, the swamp being in some places all of a mile in width, and supporting on its treacherous surface a luxuriant growth. In the depths of this morass, the home of almost every variety of Virginia reptiles, the soldiers worked several weeks, constructing the causeways knows as New, Duane’s, Sumner’s—Upper and Lower—Bottom’s and Railroad Bridges. The cutting of dams above, and heavy rains, stopped the workmen a number of times, and destroyed their labor, by converting the whole valley into a broad lake, whose waters, pressing through the length of the swamp carried everything irresistibly before them. 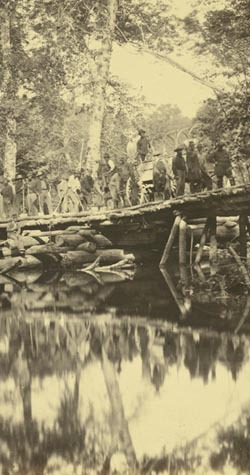 In this way, during the battle of Fair Oaks, Sumner’s troops had barely passed over, when the rapidly accumulated waters of the river carried away the bridge; and it was claimed by the engineers that the weight of the men in crossing kept it in its place. If, in that fight, our troops had been defeated, the limited facilities of re-crossing the Chickahominy would probably have led to the capture of the greater portion of the corps. The Grape Vine Bridge was so called for its tortuous course through the swamp. Its construction was necessarily rude, as rough, unhewn, and twisted logs formed the material. Down in the woods, the air seemed to be suffocating with stagnation, while beneath the pall of mist, an immense orchestra of double-bass bull frogs kept up a continual din, which at night drowned the rumble of the wagons over the corduroys.